Kitsch in Sync is London's most fun loving a-cappella choir. We specialise in performing hit songs mainly from the 1980s as you've never heard them before. Why? Because the majority of our songs are arranged specially for us by our ridiculously talented in house music team. "In KiS (as we're known to our friends) we've really put the emphasis on fun - and our audiences relate to this. As a result we've performed at festivals, events and celebrations all over London and people often ask us back for more. Plus we sing all your favourite 80s/90s and 00s songs - what more could you want?" 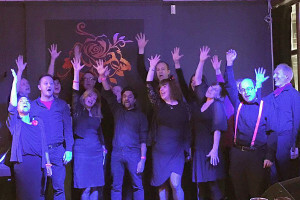 Just in case you were looking to meet some fun new people: our delightful, engaging and often awesome choir Kitsch in Sync is currently looking for some new singers in all parts. Interested? We rehearse in Borough on a Wednesday night from 7-9pm. With wine. We're a really friendly and informal group who don't insist on a music degree in order to join. You don't have to read sheet music. Being able to sing in some form is useful though. We don't audition. We just ask you to come along and see if you like us. Sound like it might be for you? Or know someone who might be interested? If you'd like to come along to see what it's all about or join in the rehearsal, drop us a line for more details (kitschinsync@hotmail.co.uk. Our amazing guests Kitsch in Sync were so much fun. Go see them if you get the opportunity.